The predicted high winds and dry conditions have prompted the State Emergency Services to warn all residents of Victoria to ensure that their fire plans are in place and ready to activate if necessary. Property owners need to stay alert and decide now whether or not they will stay - or go - in the event of a fire in their area. The information at these links is being updated regularly at the moment. If you have read them before, please check them again as more information becomes available. If you save these links to your favourites, remember to refresh them when you check them to make sure you are getting the latest information. What’s important is to strike the right balance - protecting children from harm while allowing them the freedom to develop independence and risk awareness. Exciting and challenging playgrounds do this, poorly maintained or badly designed ones don't. Health and safety laws don’t stop children having fun but ill-considered and overprotective actions do. If you join during the current campaign, not only do you stand to make your yard a safer place for people and horses while achieving a nationally accredited award, but you'll also receive a free ticket to a top equestrian event, meeting one of our top riders. 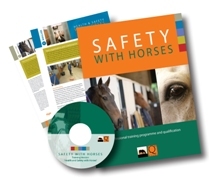 By successfully completing the Equi Study “Safety with Horses” home/stable study course and you will receive a free ticket to one of four top equestrian events including Olympia, Badminton, Burghley and Horse of the Year Show. You’ll also have the opportunity to meet a leading rider, learn about top level competition and ask questions about show jumping or eventing. There are seven start dates during the year so you can choose both your favourite event and the best time to complete your course. Anyone who is 16 years and over who has access to horses and equine facilities can take part. You’ll also need a competent person (Level 3 – e.g. AI)) who can observe you undertaking some basic but key practical activities with horses. Everyone will be able to access their own Equi Study Tutor to help them complete their course. Click here for more information on the “Safety with Horses” campaign. 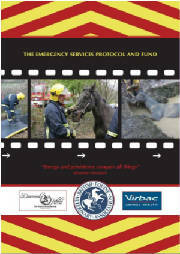 Guidelines to help the emergency services cope better with equine incidents were launched in May 2007. 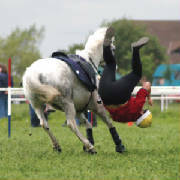 The guidelines aim to ensure that any horse involved in an accident receives proper care as quickly as possible. They cover everything from how a 999 call should be dealt with to advice on identifying horses and coping with a large animal in an incident. An Emergency Services Protocol Fund has also been set up by the BHS and BEVA, to help minimise delays for injured horses receiving veterinary care when their owners cannot be traced. The fund will also pay for rescue training and specialist lifting and rescue equipment for the emergency services. To donate to the fund, contact BEVA (tel: 01638 723555). Download the Emergency Services Protocol leaflet. In what is believed to be the first of its kind, an internet-based survey has been launched to measure the extent and consequences of horse-related injury across the USA, Britain and Australia. The survey was developed by Dr Patricia Evans at Utah State University, and has been adapted for wider international use with help from Ken Law, editor of the UK-based website Riding Safely and Denzil O'Brien, who has recently completed a 5-year surveillance program on risks in eventing. It is being co-hosted by the Equestrian Federation of Australia. The survey and data analysis are being undertaken through Utah State University. Under US law it can only be completed by people aged 18 or over. Anyone taking part will not be asked for identifying information - data gathered will be used statistically not descriptively. “We’ve had such surveys in the past but these have normally been limited to individual countries” said Ken Law “running the survey simultaneously across three countries and gaining comparable data may prove of enormous benefit in improving safety internationally – I urge everyone to take part”. Click here to take part in the survey that runs until 28 February 2009. Lantra, the Sector Skills Council for the environmental and land-based industries, is holding an initial consultation meeting on Wednesday 4 February 2009 regarding the development of National Occupational Standards (NOS) for Equine Barefoot Trimming. Currently there are no National Occupational Standards for this area of work and their development was a key recommendation from Lantra's Paraprofessionals research report: titled 'An investigative study of Barefoot Trimmers and Equine Dental Technicians'. Lantra's industry partnership manager for the equine industry and Professions Allied to Veterinary Science, Lisa Jarvis said: "National Occupational Standards describe the skills, knowledge and understanding needed to do a particular task or job. One of the uses for these standards is using them as building blocks for qualifications, so ensuring that these are right and meet businesses' needs are vital to the industry's future and equine welfare." Lisa adds: "If you want to play a part in developing these standards, then join Lantra on Wednesday 4 February, at an initial consultation meeting. The purpose of the meeting is to establish industry requirements for National Occupational Standards to ensure that they are fit for purpose." Defra has launched a consultation to revise the existing equine identification legislation. The consultation period runs from 10th November 2008 to 10 February 2009. The main requirement for the new Horse Identification legislation is the compulsory microchipping of foals born after 1 July 2009. This requirement will not be retrospective for older horses. Under the current legislation, all equidae are required to have identification. The new regulation aims to improve this current method of identification by linking each ID issued to an electronic microchip implanted into the animal. Linking the microchip and ID, which are both recorded as a unique life number on a national database, will reduce risks to human health by stopping certain animals entering the food chain, help disease surveillance, and aid recovery of lost or stolen horses. The purpose of the consultation is to seek views on draft Regulations intended to apply Commission Regulation (EC) No 504/2008 in England. The consultation document is confined to the application of a number of derogations provided for in the Regulation, along with new offences created and penalties for non compliance. The Association of Irish Riding Clubs in conjunction with Eventing Ireland and the Equestrian Skillnet are holding a seminar on cross-country course design. It will take place at Gurteen College, Co. Tipperary on Sunday 8th March 2009, running from 10.30 to 15.30 and costs €20. This seminar will give participants an insight into designing and creating cross-country courses and fences to allow horses and riders to train and compete to a high standard. It will also facilitate riders moving up the levels and give them the skills to competently negotiate the challenges that lie before across country. A strong emphasis will be placed on safety and issues concerning the safety of designing fences. The sessions will be led by Tony Ennis (A.I.R.C.) & John Swanton (Eventing Ireland). Tony Ennis, chairman of A.I.R.C., has designed the cross-country course at Gurteen College and it has since been modified by Ian Stark (British Olympic Eventer). John Swanton, former chairman of Eventing Ireland, has stewarded at many international horse trials in Ireland. John has assisted with the design and building of some courses including his own at Ashmount. The National Equine Forum is a high profile annual event that is held at the Royal Society in London. The audience includes invited leaders of the various disciplines and interests in the horse world, and is normally attended by Her Royal Highness the Princess Royal and the Minister for the Horse Industry. There are a small number of tickets available on a first come first served basis for paying guests at a cost of £100 for the day’s event, including a buffet lunch. The Forum provides an outstanding opportunity for networking with the leaders of the horse industry, and represents exceptional value for money for those wishing to engage in continuing professional development. The 2009 Forum will be held from 0930 to 1600 on Tuesday 31 March. It is a not-for-profit event that investigates topics of current interest and concern in a non-partisan and non-commercial fashion, with plenty of time for questions. Topics selected are always relevant and frequently controversial. Expressions of support in debate at the Forum can often lead to initiatives going forward, as for example with the formation of the British Grooms Association. Ü "In sicknes and in health"
The ‘In sickness and in health’ fundraising campaign is designed to support the BHS’s work of preventing the suffering of thousands of horses and ponies, which it does by providing expert advice across a broad range of equine topics. In February 2007, the Animal Health Trust (AHT) and British Horse Society (BHS) launched a nationwide Strangles Campaign, which has two aims. The first is to raise awareness of this dreadful equine plague, and the second is to gain support for the research programme. For this, the target is to raise £250,000 to fund research into the next stages of the development of improved means of diagnosis and prevention – ultimately to eradicate this terrible disease. The campaign was launched by the President of the AHT, HRH The Princess Royal, at the Royal Society of Medicine in London. It continues to make great progress, with the total raised so far standing at £159,000. Ü Riding hats and helmets are just different terms used to describe the same thing - protective headwear. Ü Wearing properly fitted and secured hats saves lives. Ü The British Equestrian Trade Association (BETA) consider that hats to the British PAS 015 1998 offer the best in terms of shock absorbency, penetration and retention. Ü A high performance helmet standard offering greater protection from side impacts and aimed at competition riders was launched in 2005. Helmets in accordance with BSEN 14572:2005 are intended for use in high-risk activities, and not to supersede the current standards. Ü Some organisations and competitions impose certain hat standards - check before you ride. Ü To work properly hats must must be fitted correctly by someone competent. In the UK, this will preferably be by someone who has received training in hat fitting through BETA or manufacturers such as Charles Owen. It is usual for anyone who has attended training to receive a certificate. Ü You'll probably buy your hat through a saddlers, tack shop or riding school. Ask if the person fitting it has been trained. Very often certificates are displayed. Remember your life may depend on having a properly fitted hat. Ü A riding hat is lined with microscopic bubble wrap. When a hat hits the ground or a hard surface the bubbles burst absorbing the impact. The hard shell spreads the area of contact over a much larger load bearing area. Anyone who has ever played with bursting bubble wrap knows that once all the bubbles are burst it's no longer any good for its intended purpose. That's why a hat should be replaced after being dropped on the ground or following a blow to the head, especially if the wearer loses consciousness. Ü Don't buy or use a second-hand hat - you don't know its history. Ü The expected life span of a hat for the average rider is five years. Ü UK: Any personal protective equipment (PPE) used by staff in the workplace is subject to the Personal Protective Equipment at Work Regulations. The main requirement of the Regulations is that PPE is to be supplied and used at work wherever there are risks to health and safety that cannot be adequately controlled in other ways. Examples of “PPE” include: riding helmets, gloves, eye protection, high-visibility clothing, safety footwear and clothing affording protection against the weather. ...it make sense to do so. Make sure it is fastened securely and meets current standards. For children under the age of 14 when riding on roads this is a legal requirement. For both you and your horse. This will help drivers and pilots of low flying military aircraft see and avoid you. It can also help the emergency services locate you in the event of an accident. Consider a mix-and-match of pink and yellow that can help you be seen better in differing lighting and weather conditions. ...and when you expect to be back. ...switched to silent for outgoing emergency calls only. Make sure you keep it on you and not in an attached saddle bag. Think about keeping it away from your major bodily organs that your phone might damage in the event of an accident. ...consider carrying some form of personal information that can identify you in the event of an accident. Include emergency contact numbers. If you carry a mobile phone include in your contacts "ICE" - in case of emergency. This can help the emergency services to quickly contact friends or relatives - but do let them know that you've stored their details as ICE1, ICE2 etc. for this purpose. ...consider getting an disc engraved with telephone contact details of your yard, yourself and your vet to attach to the D rings of your saddle. In the event of you getting separated from your horse these contact details will help a finder to make contact. Remember to make sure that the contact numbers you give will always be answered promptly by someone who can take action. You can get engraved (large dog) discs from your vet. ...only ride where you have been given permission or are legally entitled to do so. An updated Highway Code was launched in September 2007. The BHS Riding and Road Safety Test is taken by over 4,000 candidates a year and helps to educate riders in road safety in order to minimise the risk involved when riding on the roads. ...in case you or your horse cause damage or injury. If you're a horse owner your insurance may already provide cover but do check. One of the benefits of BHS Gold Membership is that it provides up to £10 million Personal Liability Insurance Cover for all the horses you own, look after and ride. The BHS is working to improve horse and rider safety on the roads. Please help them by reporting any horse/rider related traffic accidents or near misses. Ü Riding Safely is a free subscription newsletter. Ü If you’d like future editions of the Riding Safely newsletter emailed to you then click on the link below. What's new or been updated?